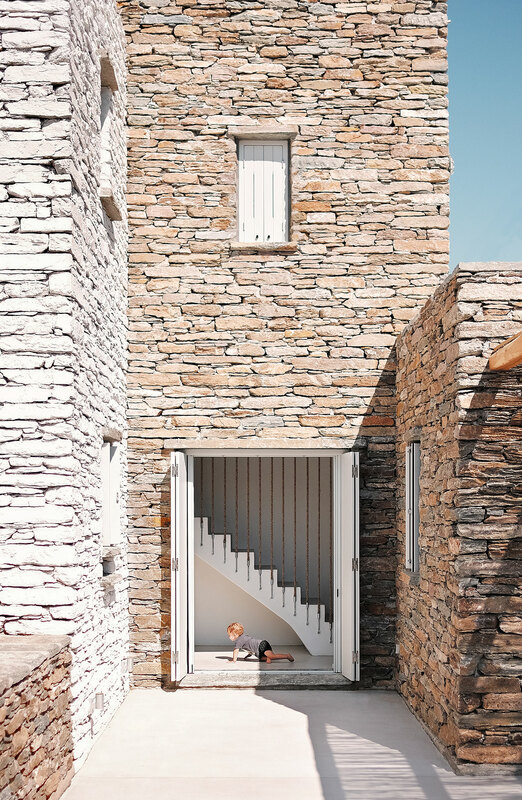 Jutting out from the surface of a steep rock face over the valley of Poisses on the Greek Cycladic island of Kea, is a private residence that Faidra Matziaraki, Victor Gonzalez Marti and the team at Cometa Architects designed with equal parts traditional charm and modern minimalism. 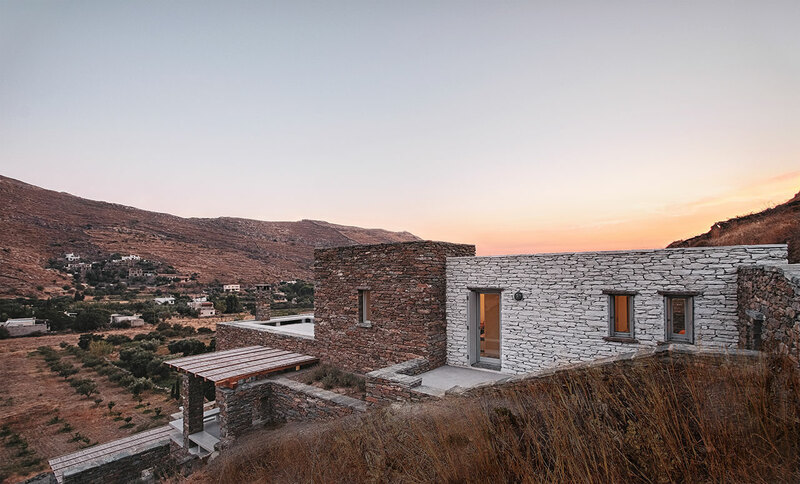 Rocksplit, as the project is titled, is built on a narrow plot of land which merges into the hillside, whereby its three volumes are stacked on each other to extend the 115 square meters of the home's footprint upwards. 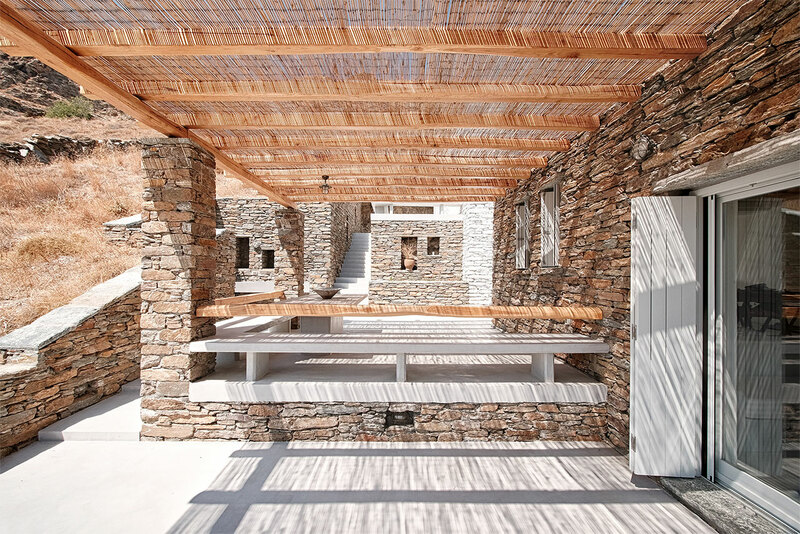 The intricate stonework of the construction - which was completed in 2016 and won an honorable mention for Best New Built Project from the Greek Architecture Awards, Domes in 2017 - is based on the traditional method of "kotounto," wherein a gap is left between the rock and the building so as to discourage the buildup of humidity. 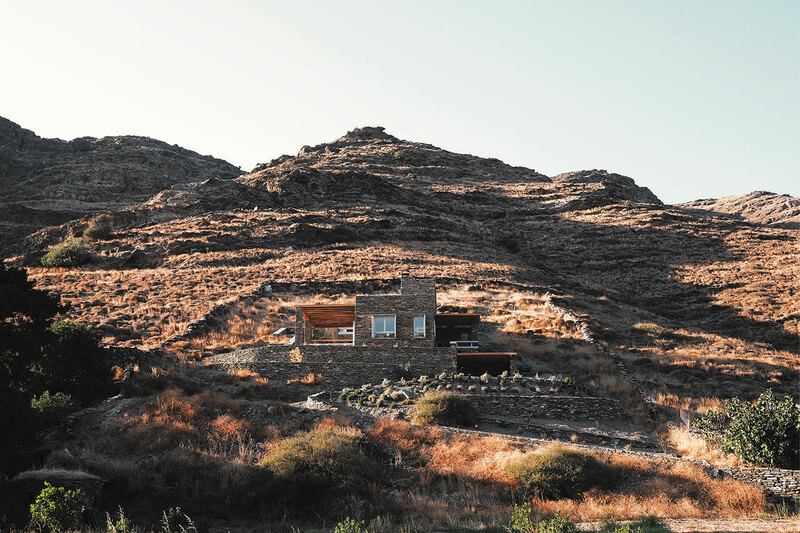 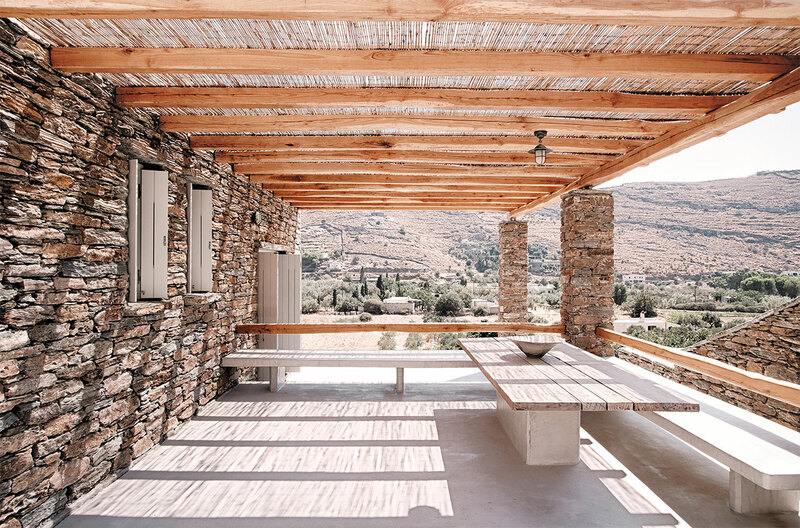 Stylistically, the locally quarried stone facing also has another use: to blend the building in with its surroundings, thereby striking the perfect cord of effortlessness that is so desired in a holiday house. 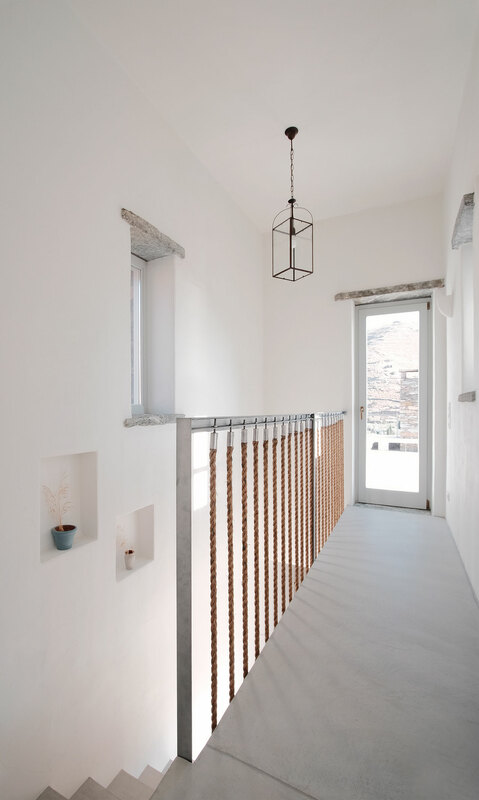 The house won an honorable mention for Best New Built Project at the Greek Architecture Awards, Domes in 2017. 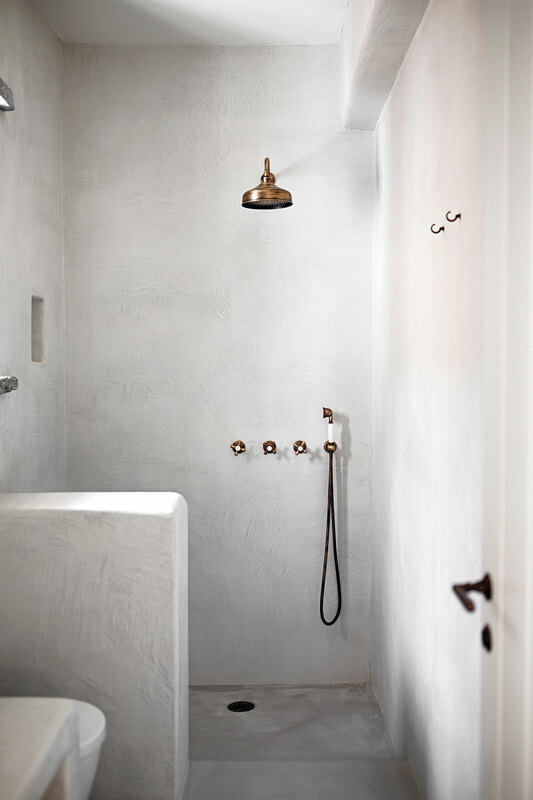 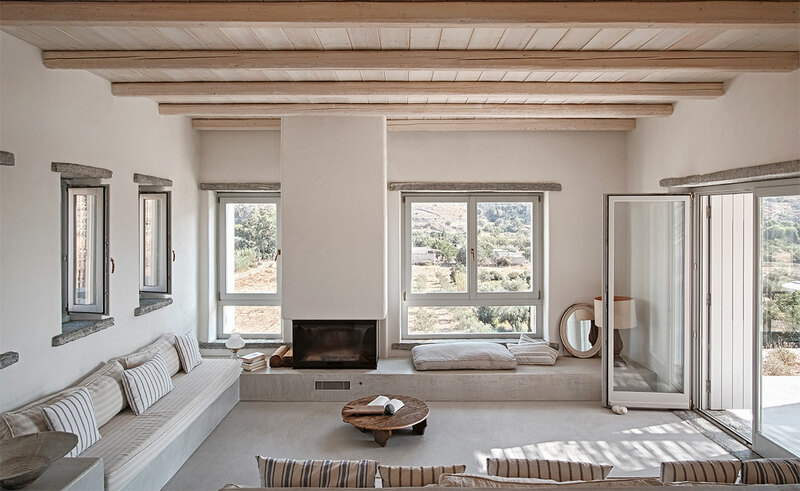 Inside, the adhered to décor, which was also overseen by the aforementioned architects, is characteristic of the Cycladic islands featuring simple, minimal furnishings, many of which are built into the whitewashed interior structure. 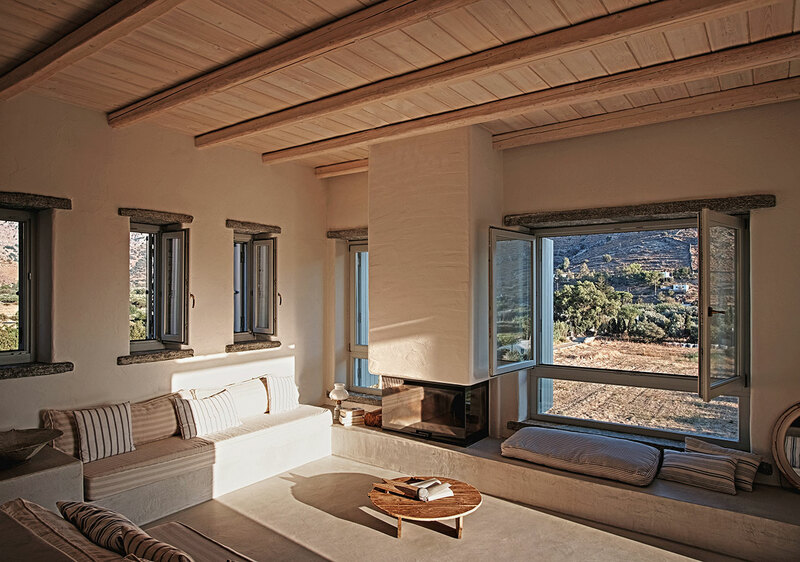 Take for instance the sofas and tables in the living room; the wraparound counter space in the kitchen; even the benches and wood-topped table of the veranda outdoor's, countered by the natural colored wood pieces, such as the kitchen cabinets and carved table, which elegantly play off the general simplicity. 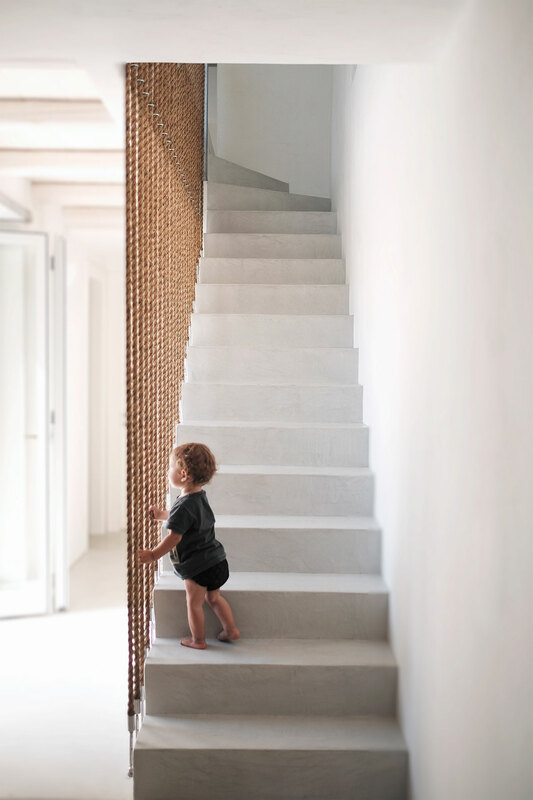 A very interesting décor feature is the natural rope, floor-to-ceiling, "banister" leading up the whitewashed staircase to the second floor. 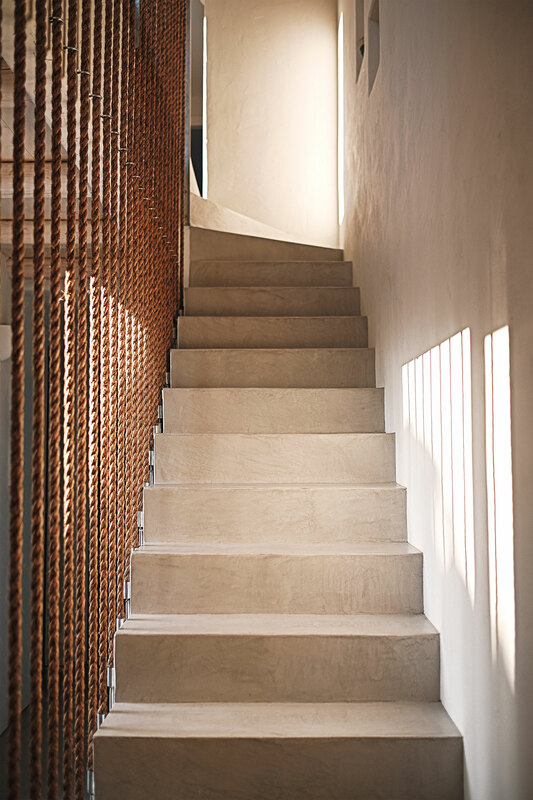 This material makes yet another appearance outside, as rope is strung through the veranda's wooden pergola creating a dappled interplay between shadows and the sun. 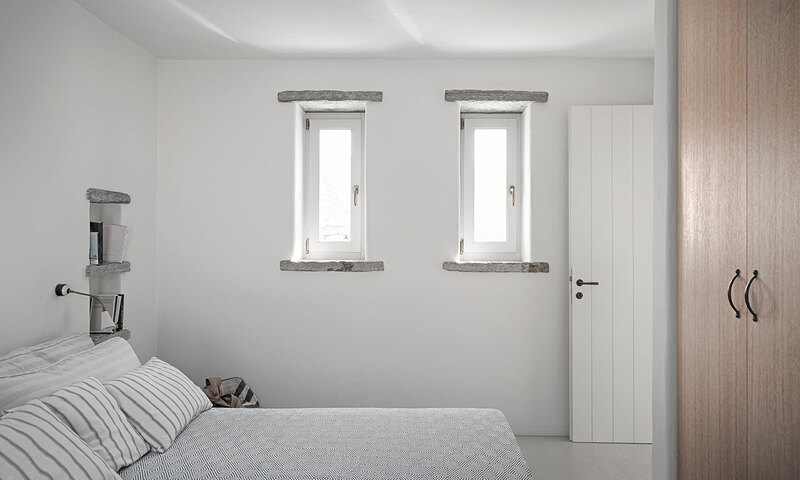 Meanwhile, the sun is again manipulated through the house's windows which feature stone lintels and pale gray painted window frames and shutters. 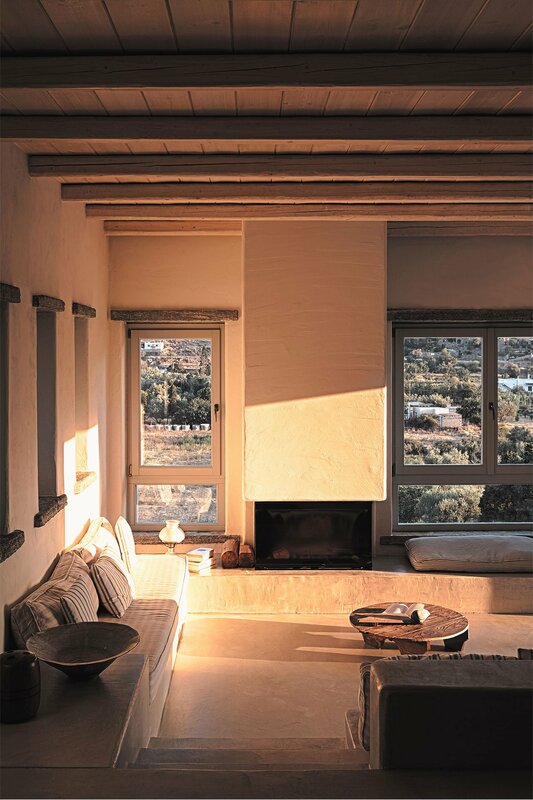 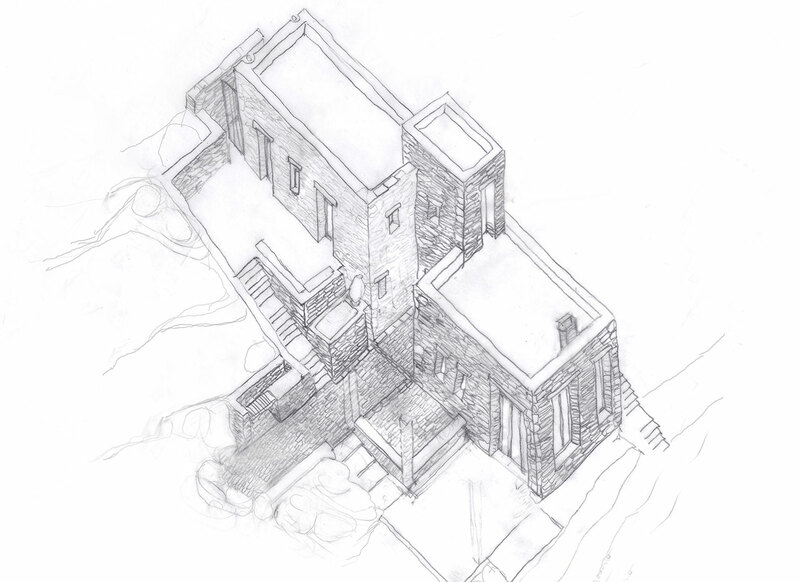 In another take on traditional and sustainable island architecture, each room features multiple windows which are small in size so as to allow light and cooling breezes in but keep the scorching midday summer sun out. 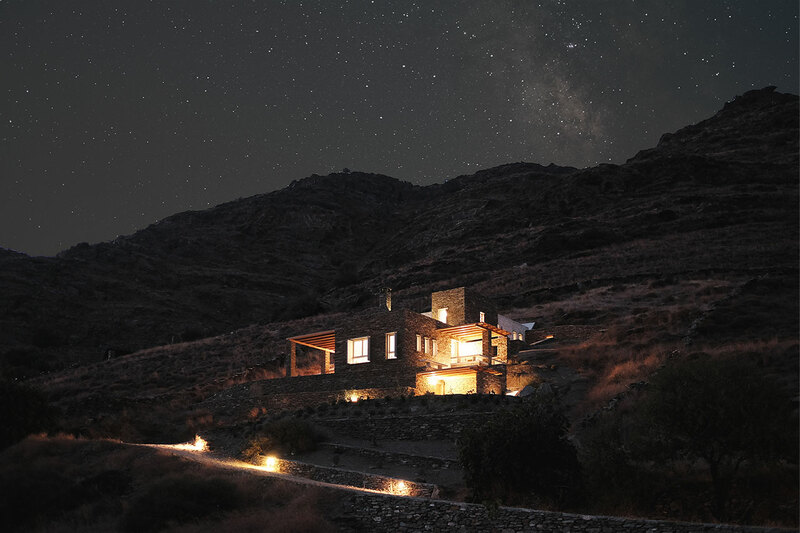 Meanwhile, the individual roofs of each of the three volumes, collect rainwater through loose stones that is then stored in an underground reservoir. 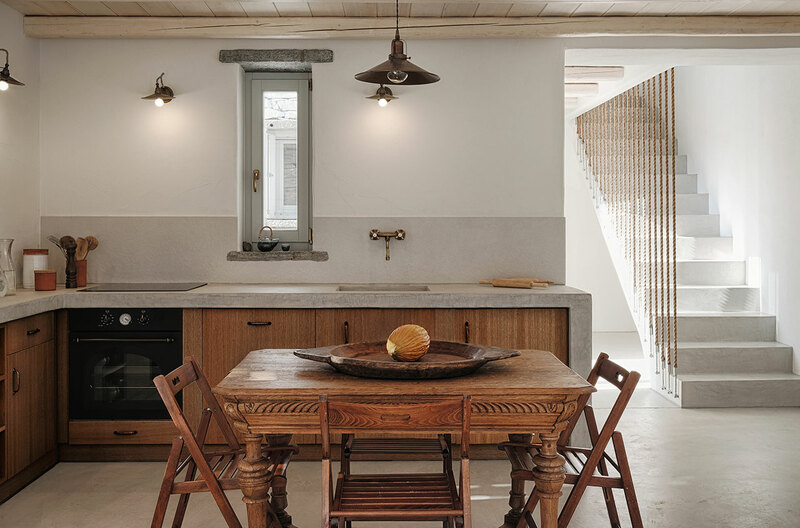 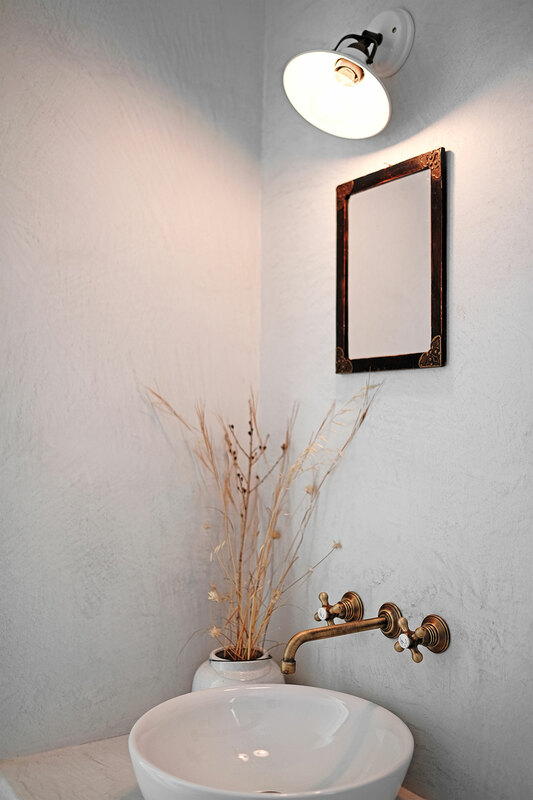 Whichever way one looks at is, Rocksplit is the sort of home that Cycladic island living dreams are made of: one that is at harmony with its surroundings, that honors local traditions, and that is tailor-made to provide the best for its residents.